The Waterfront Trail is a signed bike route that stretches for about 900 km, from Niagara-on-the Lake to the Quebec border, connecting to the Route Verte and Montreal. Along the ride you will see the fruit farms and vineyards of Niagara, continue along the shores of Lake Ontario in Burlington and Oakville before arriving Toronto. Head east to Pretty Prince Edward County and then along the historic St. Lawrence River. About 30% of the bicycle trail is along designated bike paths while the remainder is along quiet residential streets and roads. If cycling the entire route it takes about a week but most riders just tackle sections as part of a day ride. Each July there is an organized cycle tour along the route which is getting more popular each year. You can see the paved and signed Waterfront Trail as it begins next to Fort George in Niagara-on-the-Lake. The route takes you through the former capital of Ontario before heading out along the a road with mostly paved shoulders to the Welland Canal. Although this section is flat every time I hit this section there seems to be head wind. Past the Welland Canal the Waterfront Trail mainly follows quiet roads near the shores of Lake Ontario. Expect to see plenty of vineyards, peach and apple orchards along the way to Hamilton. Continuing through Burlington, Oakville and Mississauga you encounter a mix of bike paths through parks and short road sections and a lot of other cyclists out for the day. You enter Toronto along a park paved bike trail and some of the quiet residential streets of Etobicoke, often with views of the lake. There is about a 2-3 km section along Lakeshore Blvd where you might encounter some traffic. 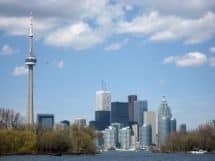 You then pick the the paved Martin Goodman Trail along the Toronto waterfront which takes right across the city to the eastern beaches with one busy section along a Harbourfront street. At this point follow the signs indicating Toronto Bike Route 4 as you follow residential streets eventually reaching a paved bike street again just before Highland Creek. In the Durham Region the Waterfront Trail is often along paved bike paths in residential areas and parks and you do pass the Pickering Nuclear Plant where deer are often seen. Heading east through the small Ontario towns such as Port Hope which feature many historic buildings. Then you begin to some apple orchards as your bicycle tour continues eastward into Prince Edward County. This area features vineyards, sand beaches and pretty country roads. Your next stop is the historic city of Kingston be sure to stop at Old Fort Henry. Many cyclists also stay at Queens University during the summer. Bicycle touring along the St Lawrence River past the Thousand Islands is simple as there is a paved trail until reaching the Quebec border. You can end your journey at the Quebec border but many cyclists continue the 80 km into Montreal along the excellent Route Verte which is mostly a paved bike trail although it takes to some quiet residential streets in the West End of Montreal. I particularly like the section along Lachine Rapids and Old Montreal. The Waterfront Trail & Greenway provides a great way to see Ontario with history, a wonderful variety of scenery and a look at both English and French Canadian regions.